Washington State’s Hercules Mata’afa was named first-team All-America by the Associated Press, the first Cougars defensive lineman to earn that accolade since 2002. Washington State DL Hercules Mata’afa and OL Cody O’Connell were named to Associated Press All-America football teams announced Monday. Mata’afa earned first-team honors and O’Connell second-team accolades, along with Washington WR/PR Dante Pettis. Mata’afa, already selected to the All-America first team by SI.com and the Walter Camp Foundation, is the first Cougars defensive player to earn All-America honors since Deone Bucannon in 2013. 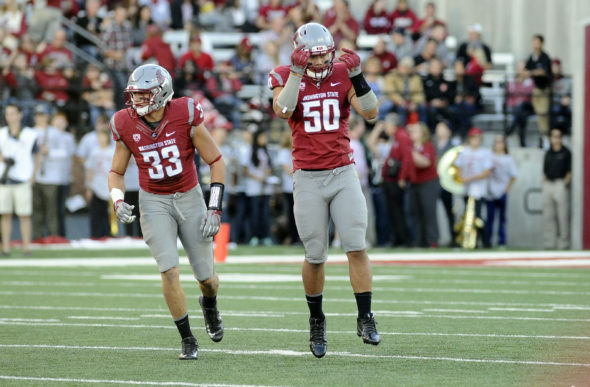 He is also the first, first-team All-America defensive lineman at WSU since Rien Long in 2002. The redshirt junior from Lahaina, HI., was named to the All-Pac-12 first team and AP Pac-12 Defensive Player of the Year after leading the conference with 21.5 tackles for loss and 9.5 sacks. Mata’afa started all 12 games, recorded multiple tackles for loss eight times and earned Pac-12 Defensive Player of the Week following the win at Utah after making eight tackles, five for loss, three sacks, one forced fumble and a fumble recovery. Mata’afa is also a finalist for the Polynesian College Football Player of the Year. O’Connell, a unanimous All-America last season, was also named to the first team by the Walter Camp Foundation. He is the first Cougar to earn first-team honors in multiple seasons since kicker Jason Hanson (1989, 1991). The Wenatchee native was named to the All-Pac-12 first team after starting all games at left guard for the nation’s second-rated passing offense. Washington DT Vita Vea was named to the Associated Press’s third All-America team. He is considered a likely first-round pick in next spring’s NFL draft. The Sporting News will release its All-America team Tuesday and the American Football Coaches Association (AFCA) will announced its team Wednesday. Consensus All American. AP Pac12 Defensive POY and AP All Pac12 at 2 positions. Kinda makes up for the coaches giving Vea Def POY honors. The guy is a beast. If he had more help ..that line would of been legend. He is a Bennett like player. Play him on DE on running downs and in the middle for passing. The Cougs just do not have the bodies to do that.